The August summer break just ended at the Society of Illustrators and last night I went to Figure Drawing with my friends Istar and Casey. Casey is visiting her family in N.J. from France and was able to come into the City for a visit. I hope that she posts a few of her figure paintings to her blog when she returns home. 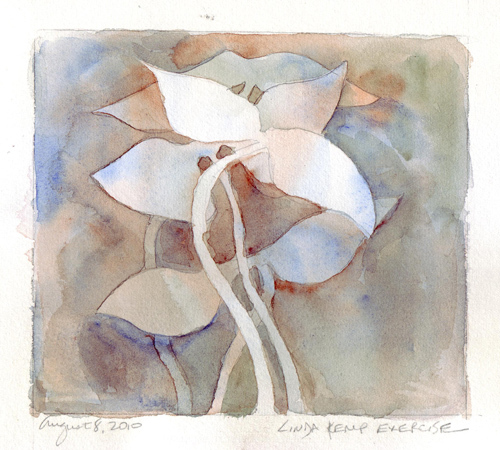 Her ink/watercolor drawings inspired me and gave me a new goal for 2011. 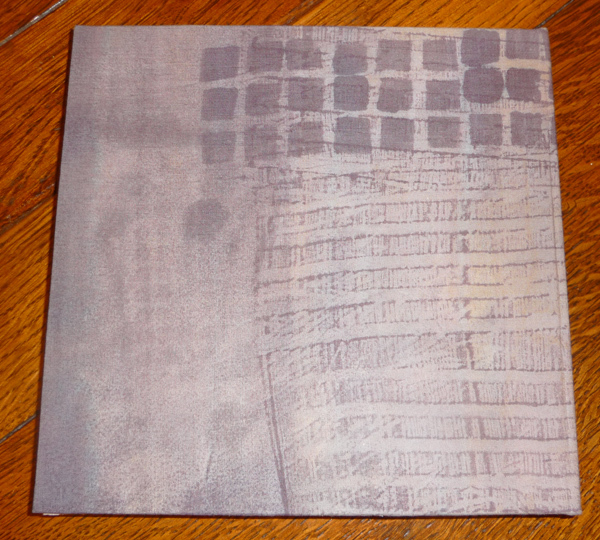 My current sketch book is slightly too big for my scanner, so there are lots of ugly scan marks. I also had to increase contrast so my 6B pencil lines were darker, and all of my left-hended smudges then were more noticeable. There were two models, clothed, for every pose. 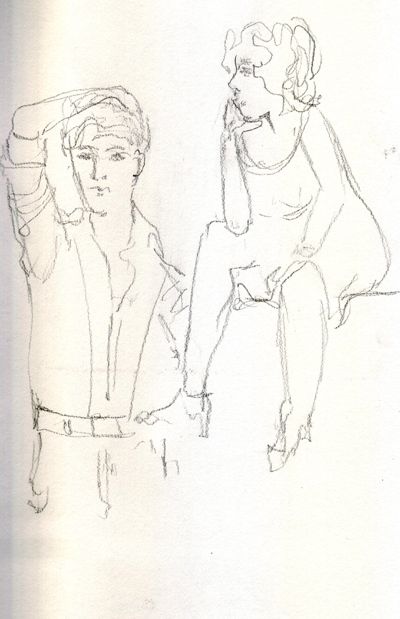 This was a sketch done of both of them during 5 minutes - just to try to capture their positions and clothing. During another 5 minute pose, I sketched only the male model because he was in a challenging twisted position. 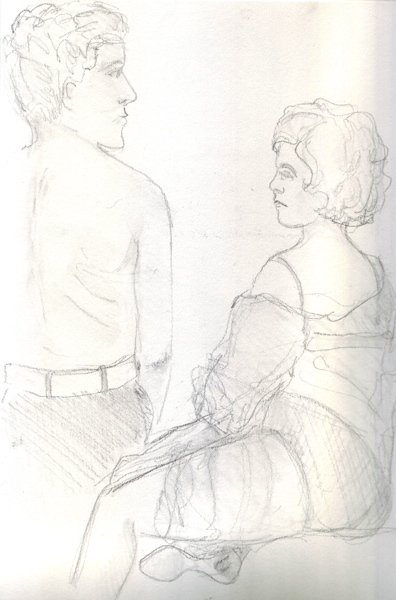 I sketched both models during the next two 20 minute poses - the male model without and with shirt and the woman in a negligee. This is the beginning of my second year of live figure drawing and I am trying to spend more time on faces. After I finished sketching both models during a 20 minute pose, I spent some time trying to better capture the face of the male model. Learning to "Paint Outside the Lines"
Linda Kemp's book, Watercolor Painting Outside the Lines, was mentioned on the Everyday Matters message board, and on View From the Oak Blog. When I have gift cards, I buy this type of art technique book for my library and this year it is one of my goals to actually read and sometimes do exercises or demos from some of these books. This was my book for August. In order to really understand the technique of painting just the negative space, I had to try the first two exercises in this book. 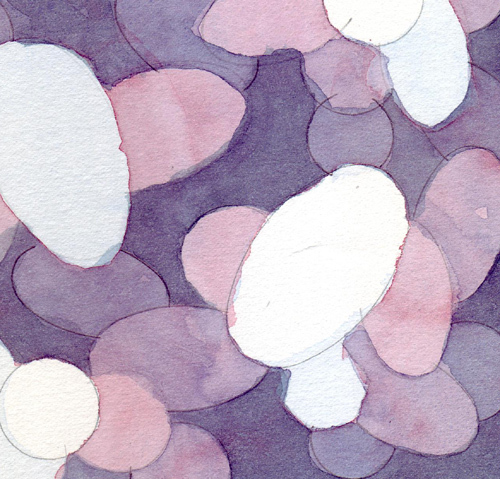 Exercise 1: Paint many different size circles in groups and paint only the negative space. This painting has 5 layers. I was quite messy, and didn't keep nice smooth edges, but I accomplished my goal. I did understand the concept after doing this exercise. I just found Linda doing this exercise on a You Tube Video. 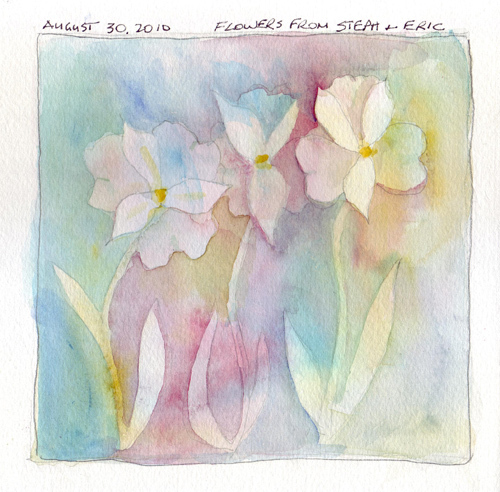 Exercise 2: Same technique, but with a stem with 2 leaves, and a watercolor underpainting. Again, I was quite messy with the outlines, but now understood working wet-in-wet and creating interesting color washes. Although I did this exercise from her book, I just found a demo of it on her website. Extending the Lesson Using My Original Image: Friends brought a lovely bouquet of flowers Saturday evening and I decided to use the flower and leaf shape from one of the flowers to create my own negative painting. Then I created Two Magnetic Bookmarks using the same flower and leaf shapes. The technique for making these was posted previously. But now I use individual magnets sold at Staples as adhesive business card magnets - and I cut them in half vertically. I just made my second square journal. 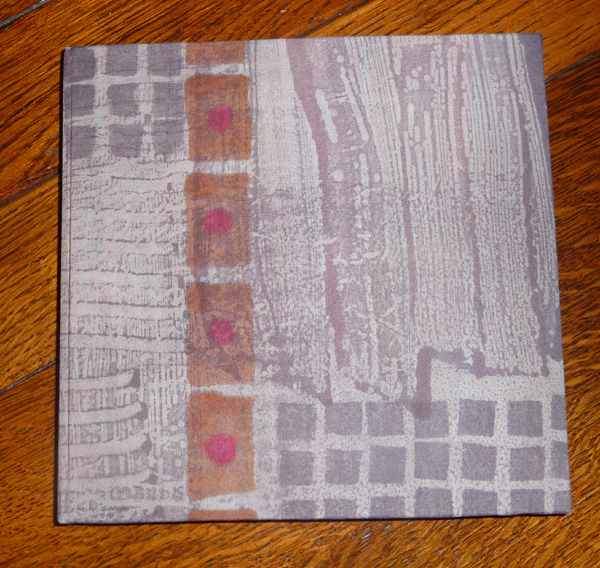 The cover was made with cloth that I dye-painted with Procion MX dyes and fused toThai mulberry paper with Wonder Under. The paper is FA 140 lb soft press extra white - 6 signatures with two folios per signature. Since the book cloth is so "busy" I used Canson Mi Tientes for the end papers. I started making my own watercolor journals because I couldn't find any that I liked. 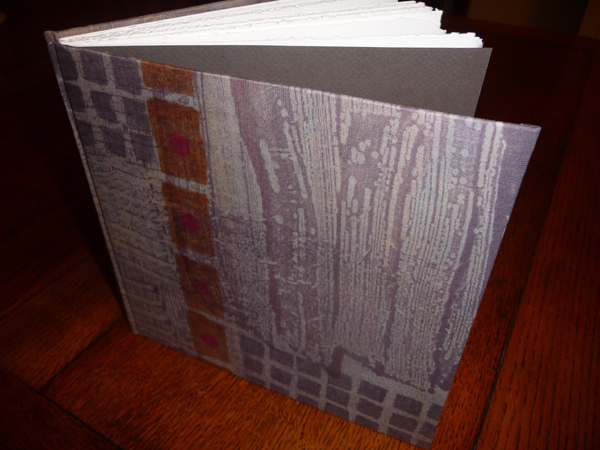 I took a 1 1/2 day workshop on making cased - in journals and now love making and using the journals. There is lots of information and photos of many journals in the Bookbinding category on the right. 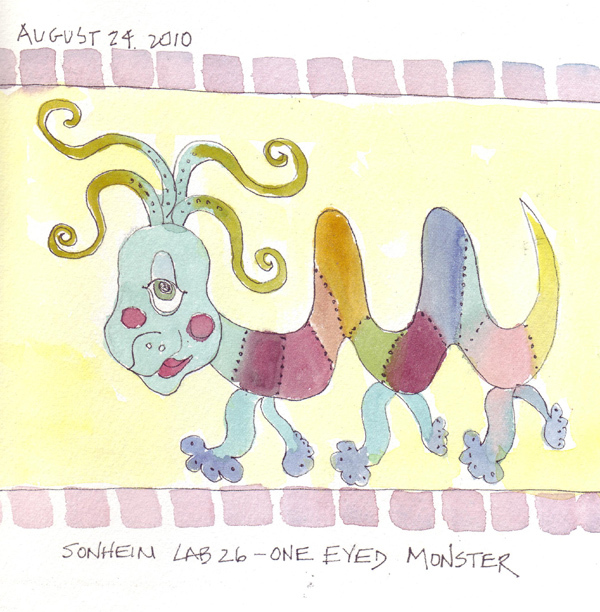 Lab 16 in Carla Sonheim's Drawing Lab book is to draw !00 Faces. I cut 20 pieces of watercolor paper and packaged them with a pencil, eraser, pen, and 7 watercolor pencils - and now keep it with me when I leave the apartment. 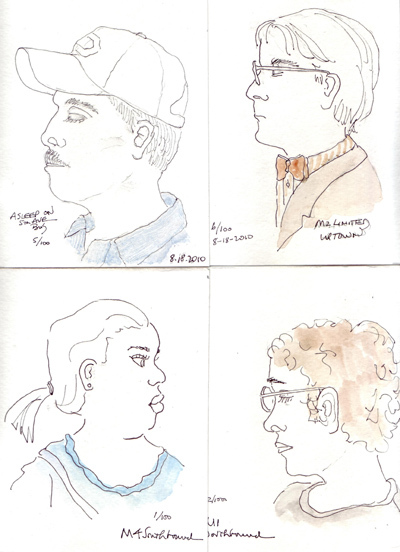 Here are 4 sketches done on the uptown-downtown buses. 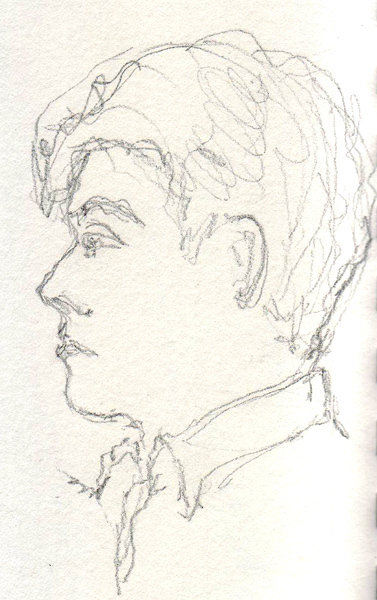 I haven't drawn strangers from such close proximity before and it was fun. These are clearly faces, not portraits! I'm interested to see the way these 100 face drawings will evolve. The only rule I have is to carry my pouch with me when I leave the apartment and to number them sequentially as Sonheim suggests. We spent a long weekend with our grand daughter Annabelle in Washington DC and my daily journal pages were all done in a sketchbook that I have devoted to her neighborhood and her life during each of our visits. Previous entries can be seen by clicking on the Washington DC category on the right side of the page. 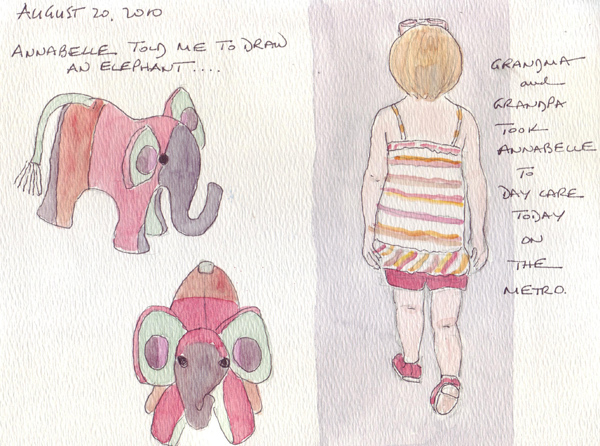 When I asked Annabelle what I should draw, before we took her to day care on Friday, she told me an elephant. So I painted one of her very small stuffed elephants. On the way to the Metro, I took several photos of her walking/running ahead and drew that image for the rest of the page. I still rarely sketch my grandchildren except from the back because I'm always disappointed that my drawings don't look like them. On Saturday morning we went to work with Daddy at the NIH Clinical Center, so she could play with Grandpa and I could see the art quilt exhibit that is currently hanging in the lobby. Art quilters who read my blog should look at the link - each spectacular, color photomicrograph taken as part of a research project was translated into a quilt by individual artists. 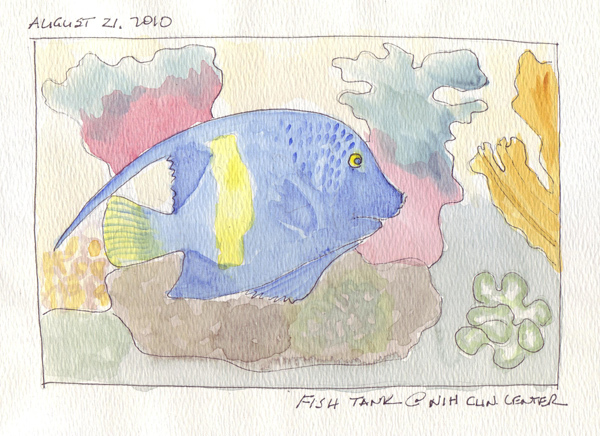 In an alcove off the lobby, near the wall quilts, there is a huge fish tank with several beautiful, large tropical fish. This one was my favorite, although we need to contact the curator to learn its name. Any help from fish experts would be appreciated. 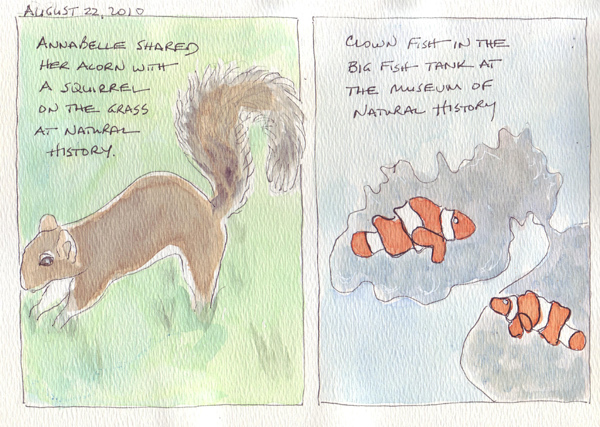 There were intermittent showers on Sunday so we went to the Smithsonian Museum of Natural History. The squirrels are quite tame around the Washington Mall and this one eagerly took Annabelle's acorn when she dropped it for him at her feet. Inside the Museum there was another great fish tank with lots of Nemos - as Annabelle pointed out. Annabelle is our only grand child that doesn't live in New York City - and I continue to be delighted that we're creating memories of our visits in the Annabelle Sktchbook.